The Cookie FM Blog – A Football Manager website dedicated to providing you with stories, updates and guides. A Football Manager website dedicated to providing you with stories, updates and guides. 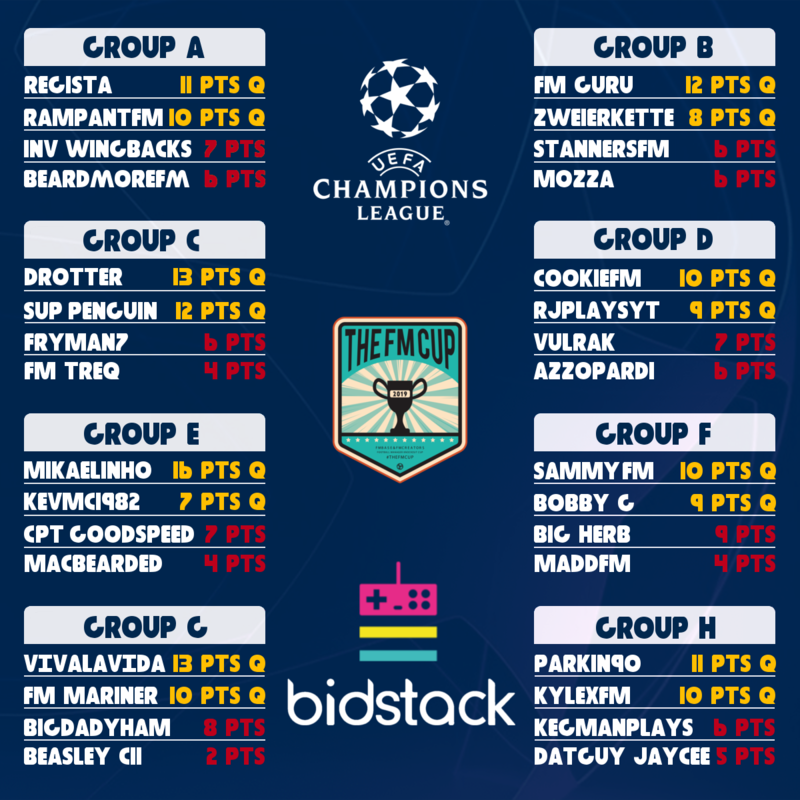 The bidstack FM Cup: Group Stage Complete! In this post I will be looking at the completed group stages of the bidstack FM Cup. If you haven’t heard of the bidstack FM Cup before or you don’t know what it is about. Read about it here. 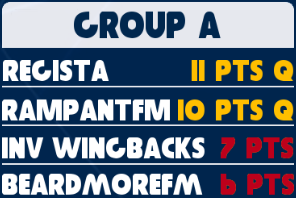 The group stages of the bidstack FM Cup have been a spectacular showing with many big hitters going out. We will go through each group one by one and then move onto the First Knockout Stage and see who everyone got!?! Group A turned out to be quite close. Inverted Wingbacks should feel very hard done by as her away game with RampantFM was forced to a loss by an FM Touch crash (there’s a few). Every game was tightly contested even if some scorelines didn’t show it. 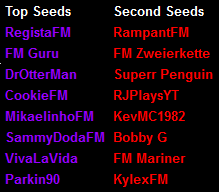 However, in the end RegistaFM and RampantFM (luckily or not) go through in first and second seeds repectively. There was only really 1 real competitor for top seed in this group. FMGuru absolutely smashed it with wins against every opponent. However his group dominance was made mroe difficult by FMZweierkette’s resilence to back down. Both go through in top and second seeds. An unfortunate time for Mozza and StannersFM as a case of too many draws cost them in the end. A greatly contested group nonetheless. Group C saw a difference in true class between the creators. FMWEC champion Fryman7 had a difficult tournament only managing to get the 6 point total. Another FMWEC legend FMTrequartista couldn’t get off the ground in this one. It was superbly dominated by DrOtterMan and his “GrassnGear” tactics and Superr Penguin who played it brilliantly. 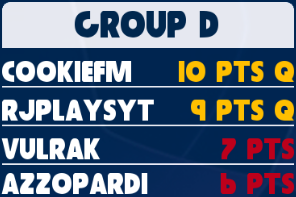 There was no crumbling here for CookieFM as he went on to claim and maintain top seed in Group D. RJPlaysYT joined him with fantasic wins over Vulrak and well fought draws against Azzopardi. There was a brief chance for Azzopardi to get into the knockout stage “IF” he beat Vulrak. He couldn’t do it and Vulrak claimed a respectable 3rd place finish. This group was dominated by the one and only MikaelinhoFM who achieved an alsmot perfect points total. Macbearded crashed out of the group quite early which was unfortunate. It was left for second seed to be decided. Captain GoodSpeed couldn’t quite get enough points to make it count. Then it was up to MikaelinhoFM against KevMC1982. MikaelinhoFM needed to beat his opponent with a greater goal difference of 6. It didn’t happen and KevMC1982 scrapes through into second seed. A difficult tournament for MaddFM gave the other 3 creators a chance of a real contest. This group was the closest group in all of the group stages. 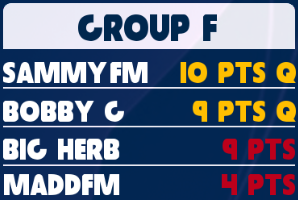 SammyDodaFM managed to get into top seed via a 1-0 win over Big Herb the Nerd thanks to a luxury second half FM Touch crash (Another one I know). It was then up to the games between Bobby G and Big Herb. It was always neck and neck; with draws against each other and both beating MaddFM. It meant second seed went down to a tie breaker match. This happened because all of the table statistics were all the same as well as “matches between teams”. The tie breaker was played and Bobby G claimed the victory and the second spot seed. Group G was always left in the balance until the very end. BigDadyHam was last to play all of his matches. At that point he needed to beat Beasley C11 twice and with a greater goal difference of 7. He couldn’t manage the 2 wins. BigDadyHam got a draw and a win but at that point it was all too late. However, he did manage to get the greater goal difference. The group was always dominated by VivalaVida who went through in top seed. FMMariner played his part in claiming second seed. Group H was a bit of a mixed bag with Parkin90 fighting the bloggers corner and succeeding by claiming top seed. The second seed was a battle between KylexFM, KegManPlays and DatGuy Jaycee where the latter crashed out mainly due to another series of FM Touch crashes. However, KylexFM came out on top this time around and progresses. The Group Stage has now been completed. It has been a great contest all in all. Yes, some issues with FM Touch but when aren’t there! I will be keeping an eye on all FM Touch crashes and issues and sending them off to Sports Interactive. All Group Stage competitors have been great sports and have been one of the main reasons this FM Cup is running as smoothly as possible. I personally want to thank all of the creators involved in the Group Stage for all the hard work and effort they’ve put in. So, the group stages have been completed. A wonderful step in the right direction. We have our 16 Knockout Stage competitors. There were 3 pots (Top seeds, Second seeds and Positions). Top seeds were drawn first, followed by the second seeds and then placed in a tournament position. It is a two-legged tie. To do this on FM Touch you must play each other twice in a league format and keep track of away goal manually. If scores are level after the 2 matches including away goals then you must play a further 1 match and the classic “golden goal” rule will be in place. First team to score wins. The First Knockout Stage draw is complete. We have our 16 creators placed and they all know the route to the Final! Just to make it clear here is how it looks in tournament tree format. Thank you for reading this update on how the bidstack FM Cup Group Stages have gone as well as the Knockout Stage route to the Final. Stay in touch with the competition through Twitter via FMBase and FMCreators. To have your say and truly be involved join the FMCreators discord. Please do let me know in the comments or on Twitter any feedback you may have. See you next time. In this post I will be looking at the group stages of the bidstack FM Cup. If you haven’t heard of the bidstack FM Cup before or you don’t know what it is about. I wrote an article on it here. The group stages for the bidstack FM Cup were drawn live on Twitch by one of the admins Mozza. It was a very tense draw with many big hitters being drawn together in the same groups. As you can see from the draw there are some really challenging and even groups. 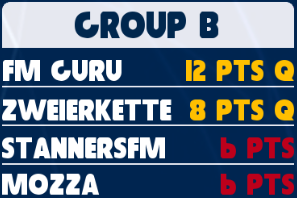 Group B is a prime example of the Football Managaer big guns going up against each other with FMZweierkette and FMGuru in that group. 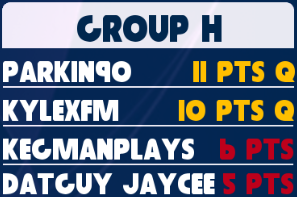 Group H is a perfect example of a level playing field with KylexFM, KegManPlays, DatguyJaycee and Parkin90 all being at a similar reputable standing. Only a few games played in Group A bit it is already heating up to be a very tightly contested group. It all hangs on Regista’s games. But Inverted Wingbacks currently in top spot with 4 games played. Not many games played in Group B. But already very tight in the games. The big guns had to settle for 1 win a piece whilst Mozza and StannersFM couldn’t make the most of their matches. FM Zweierkette currently top on goal difference. Just the 2 sets of games played in this group. That’s Otterdam City looking pretty at the top of the table. But, so much left to be decided in this group. Some would say extra pressure has been thrown onto Fryman7; previous FMWEC champion. 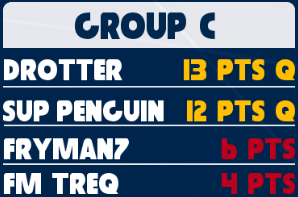 But who knows, Superr Pengu1n too on goal difference after only the 2 games played. The first completed group within the first week of the competition. Big congratulations to the effort put in by this group. It was a greatly contested group with qualification in doubt until the very last game where Vulrak snatched qualification away from Azzopardi’s grasp. 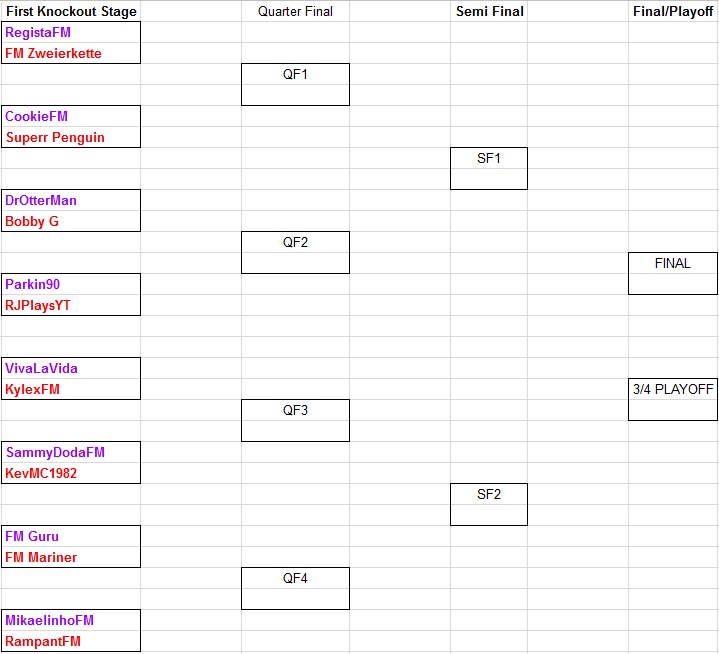 CookieFM and RJPlays who were considered underdogs to qualify from this group. Have done it! Big congrats to you both. Group E are waiting on 1 game to be played between Mikaelinho FM and KevMC before its complete. 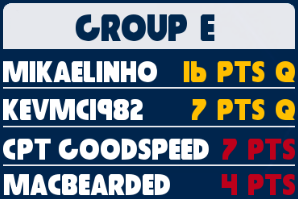 Unfortunately, Macbearded is already out of the running but Cap GoodSpeed still has a chance of qualifying if Mikaelinho can beat KevMC in the 2 games with a goal difference of more than 6 goals. Currently top is Mikaelinho FM on a smashing 10 points. Only the 1 set of games been played so far in this group. A long way to go that’s for sure. But SammyDoda will want to bounce back from the defeat and look to improve in the coming games. Bobby G sits top othe group with 4 points. A lot of football to be played. 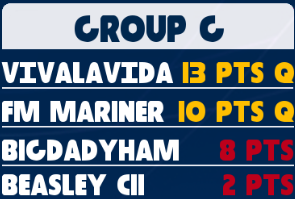 Group G has already had 2 front runners so far in FM Mariner and VivalaVida. BigDadyHam has it all to play for. Beasley will need to make sure he takes 6 points from BigDadyHam if he has any chance of qualifying. FM Mariner sits top of the group on 9 points. KegManPlays has smashed out his 6 games and has a total of 6 points so far. The rest of the group have it all to play for with points on the board for everyone already. KegManPlays sits top at the moment. 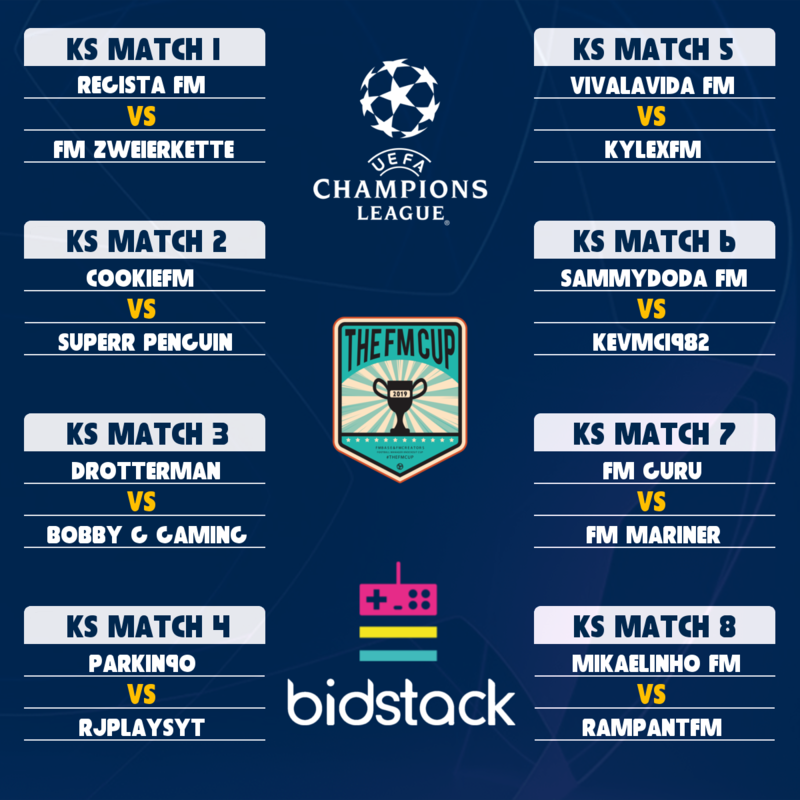 Thank you for reading this update on how the bidstack FM Cup has gone 1 week into the competition. Please do let me know in the comments or on Twitter any feedback you may have. See you next time. I want to first say that I am officially back into the world of creating Football Manager 2019 content. This in mind, I’ll be blogging this new save mainly out of frustration to be honest with you. As most of you know I’m a vivid Manchester United FC supporter. Let’s just say I’ve been less than impressed with how we’ve performed since the main man, the legend; Sir Alex Ferguson left the club. Let alone how disappointed I am with how we’ve started this 2018/2019 season. This is why I am going to blog about Manchester United FC on Football Manager 2019. Now, I know I’ve done a few Manchester United saves within the last year, but it just shows how annoyed, frustrated and disappointed I’ve been with Manchester United in real life. My aim for this save is to bring back the good old glory days as well as a clear philosophy of playing football. Something which the club has distanced itself from in recent times. I want us to play counter attacking, determined football. I’ll aim to bring through youth players as well. Something Manchester United were known for. I’m not expecting anything like the class of 92 but 1-3 youth players making first team appearances every few seasons would be ideal. That just leaves me to say thank you for reading this brief introduction to my Football Manager 2019 blog save. This blog will be released as and when to be able to fit around my other commitments and Football Manager content. If you have enjoyed reading this please leave a like, follow the website and let me know any feedback on Twitter. Catch you next time. In this post I am going to explain how The bidstack FM Cup is going to work as well as the history of the competition. The history of this competition is simple. This competition ran under a different name last year “The #FMCreators Cup” because of the simple reason we didn’t have a sponsor name last time around. However it was sponsored by 2Game for prizes. The final of last years #FMCreators Cup was contested between Kevmc1982 and Incredible_moo with Kev coming out on top and winning the Final. We have continued this tradition of an annual tournament but this time because of the hard work from the #FMCreators admins as well as MozzaPlays we have secured a big sponsor in bidstack. Also thanks to the excellent work from whattheforkGaming we have our logo too! It’s safe to say everyone is excited to get this tournament kicking off. Unlike last years tournament we have decided not to use the entry process of “first come, first serve”. This time content creators can apply to participate in the competition and the board of admins will decide who the 32 participants are. The Application process is now closed! The only rule is you have to choose a squad of 18 players out of the current UEFA Champions League teams. There is no limit to how many players you can have from each team. The teams you can choose from are the group stage teams from the 2018/2019 UEFA Champions League. Once you have selected your squad you need to send it to Cookie FM via email on cookiesfms@gmail.com So he can put your squads together in the same DB for fairness and equality. Cookie FM will then send your squad back to you. The squad file will need to be put into “sports interactive – football manager touch 2019 – exported teams”. The matches will be played on Football Manager Touch 2019 via Versus mode. For the group stages you will need to select league match and for the knockout stages you will need to select knockout match. This will enable draws in the group stage and extra time & penalties in the knockout stages. Once into Versus mode on Football Manager Touch 2019 you will need to import yourself our exported team. On the select team screen you will just click the import team button and your team should be there. The admin team will be in control of putting the squads together & keeping note of the results/tables. When sending your team to the admins please include a home kit and away kit (shirt, shorts and socks) that you would like your squad to wear. You keep the same squad for the entirety of the competition. You may utilise any formation/ tactic that you wish. The structure of this cup will be the exact same as the UEFA Champions League from the Group Stage point I might add. This is to link in with the squad rules. The first port of call would be to draw each manager into their designated groups (A – H). There will be 4 managers in each group. Each manager will play each other twice. The easiest method of doing this would be to play 2 matches consecutively when playing each opponent. This would mean that every manager will play 6 matches in the group stages. There would then be another live draw for the second knockout round where the competition turns to one legged knockout matches. After each round from here there will be a live draw explaining who is playing who. #FMCreators admins will be in charge of doing the live draws for each round via twitch. If the connection or the game cuts out or freezes the game must be replayed unless the crash/freeze occurs before half-time. If it happens after half-time then the result will stay as it stands. If the match cannot be replayed then the admins of the bidstack FM Cup will put the match outcome to a vote. If a match isn’t played then the admins will look at the evidence provided and give a standard 0-3 defeat to the person in the wrong. Being FM’d is not an excuse to have a match restarted. Friendly banter at all times, any abuse or bullying then you will be kicked from the competition. If a participant has to leave the competition the admins will either replace the competitor or hand out 3-0 wins to that persons opponents. Any injuries and/or suspensions recieved will only affect the head to head in progress. 1 week to apply for a place. 1 week to submit the squad of 18. 2 weeks to complete the Group Stage matches. 1 week to then complete every Knockout Stage. The competition is due to begin on 17/11/18 and expected to take up until 15/12/18 (subject to change). The part everyone wants to know is what’s the prize! Well, we have a cool £1,000 to part with as our main prize pot. This is courtesy of bidstack; so make sure you send them some love and support. We have decided to split the £1,000 3-fold into a 1st place prize of £500, a 2nd place prize of £350 and a 3rd place of £150. We feel this is a fair way to split it between our top 3 FM Cup performers. As we have claimed bidstack as our massive sponsor for this competition they do have some requirements that all 32 participants as well as the admins need to fulfill in order to get the full prize pot. Content Creation Trailer/Overlay – It doesn’t matter how you’re creating your FM Cup content. You will have to agree to display a short clip advertising bidstack (Youtube) and an overlay featuring their logo, the FM Cup logo as well as your own logo as well as adding a clickable bidstack logo link below the stream. Everyone involved will need to use the hashtag #bidstackFMcup for promotion on Twitter. Participant matches need to be streamed, blogged or youtubed. Please get in touch via Twitter or the #FMCreators discord for any queries. Good luck and we look forward to seeing you compete in The bidstack FM Cup. On this website you will find all things Football Manager from guides to save updates. First thing is first; Who am I? I am known as CookieFM on Twitter. I have played Football Manager since its inception in 2005. Before that, I had played Championship Manager as well as other management games such as Ultimate Soccer Manager, FIFA Manager and Total Club Manager. I would like to think I have a lot of experience about the wondeful game that is Football Manager. Does that mean I’m any good at it? Does it heck!?! In the other reality known as real life; I have worked in the football industry as a coach an Academy Manager. These roles were excellent while they lasted but asked a lot of me physically and mentally. However, in recent times I have turned my attention to teaching within Special Needs schools; Which is amazing! Although, I do miss my coaching of academy teams. Maybe we’ll get back to it someday. I support Manchester United and I have never seen them play live! I know, shocking; How can I even support them or call myself a fan? Well to put it simply; David Beckham and the Class of 92! I grew up watching the Class of 92 tear the Premier League up and so fell in love with them. I live in Bournemouth and so I do follow AFC Bournemouth as well. My favourite player to ever grace the sacred green turf has to be Ryan Giggs for one of the many reasons that his creativity on the pitch was second to none. Anyway, I think that is enough about me. I would like to find out about you wonderful people reading this. Let me know who you support and why as well as who your favourite ever player is in the comments or via the contact page.